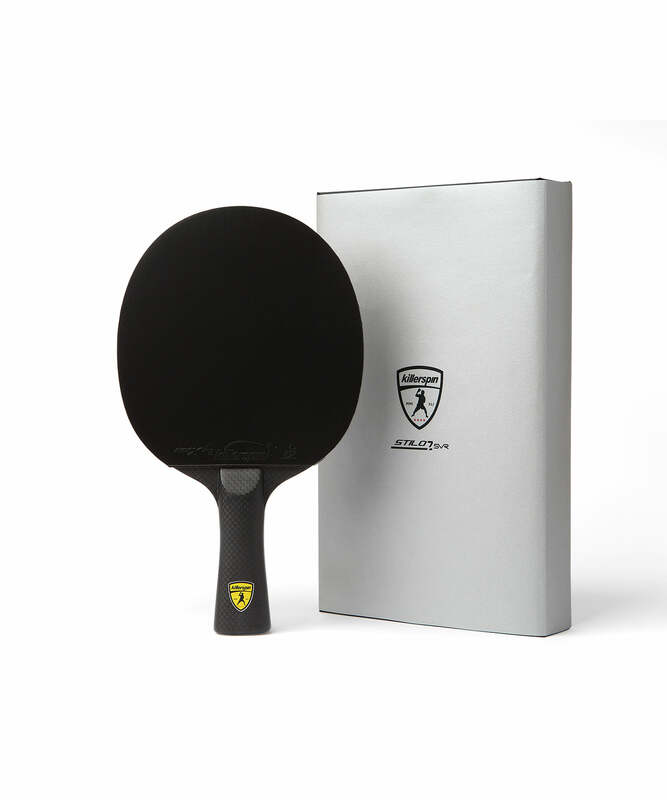 My son's been really into table tennis lately and we are considering buying him a new padle. Currently deciding between Killerspin and Stiga. Can anyone, please, suggest a better option and point out pros and cons of each. Thank you! Does he really need an upgrade, and what equipment would constitute an upgrade? Is he playing in a club several times a week, receiving individual or group coaching, at school or in a sports/health facility without skilled TT coaches, or playing in the garage/backyard against family and friends? Most 4-year-olds would benefit from a light setup with a thinner than average handle. Around the age of six, most kids have developed sufficient wrist strength and motor skills to handle a racket of normal weight and size. How much do you envision spending? You can get good competition rackets (which I myself could certainly use in a tournament) for less than $20 if ordering from China is OK for you. You'd have to expect delivery to take a month or so, and you don't get the "bragging rights"/star rating that come with the better known brands. Most likely, Iskandar Taib's default suggestion will do (that would be one of the China orders I mentioned above). Killerspin does make appropriate equipment, but some of it isn't. Some isn't legal for tournament play (green rubber, or both sides black), some wouldn't be appropriate for beginners (carbon fiber) or juniors (too heavy). And you're probably thinking about the Killerspin rackets on Amazon. All of these are what we call "premades", some are probably OK but look out. By "Stiga" I imagine you mean one of those premades you find at Target or Wal-Mart or on Amazon. These, in general, have a bad reputation, being heavy and slow. Stiga is a well-known brand of competition equipment, but the pre-mades don't fall under that category. The REAL Stiga stuff can be found at table tennis shops such as tabletennis11.com (this is in Europe, though). 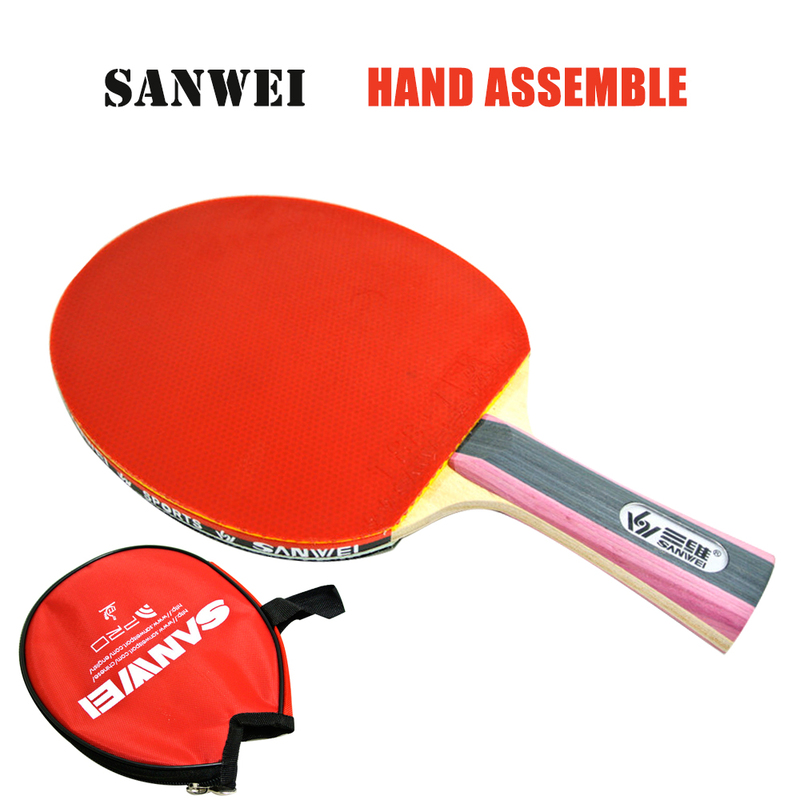 The Sanwei M8 blade is very good, very similar to some all-wood Stigas, is lightweight, and this one comes with T88 rubber (which is a good Chinese rubber). For $13.88 (wow - price came down again) including shipping it's hard to beat. The fly in the ointment is the 3 weeks you'll have to wait before it arrives. It came w/ Sanwei A+ red, and T88-III black can't complain for $13. I bought some recently. They have M8 stamped on the handle. They might vary in design a bit though. I agree that they would suit kids. The handles are a bit thinner than average. Interesting. I'd be surprised if it's not a M8 blade, but it's also very interesting that they're assembled at the Sanwei factory rather than at XVT. If their operation is anything like Yinhe's, the rubber used would vary depending on what's in surplus at the moment - supposedly with Yinhe's pre-mades if you're lucky you might find a sheet of Big Dipper instead of the usual 9000. Might order one just to see if it's got the M8 graphics on the blade, and to see how the rubber is applied (if it's easy to remove - on the Yinhe premades you can easily REMOVE the rubber but you'll end up tearing the sponge so you can't reuse the sheet elsewhere). The color used for the handle has changed over time - most of mine are grey with a tiny stripe of red, these pink and blue ones seem to be the latest production. I find that 729 rubber is easier for beginners to come to terms with. Also, the price varies, and is a little more expensive than XVT, but delivery is much quicker. On sale in a few days, so the normal price has gone up a bit . The link posted by brokenlasagna looks like a premade, not an M8. I got the same grey and pink handle thats in the XVT image. 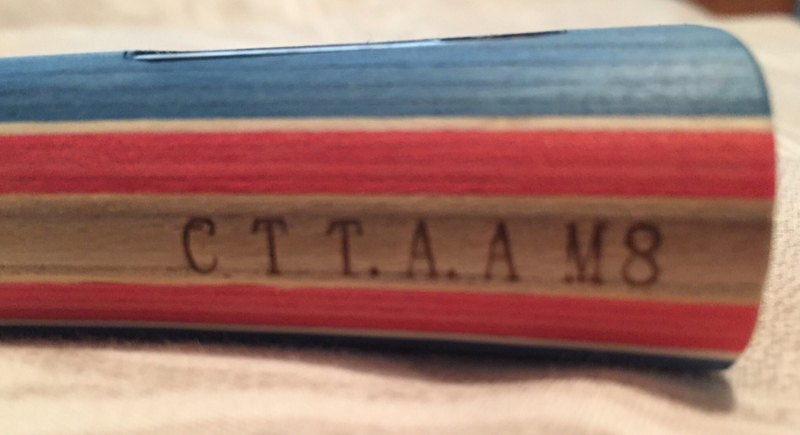 No cttam8 imprint on the handle for mine. I have one coming, I'll compare it with the ones I have. The one with the 729 rubbers (it's "General Sponge", so that's Batwings) is from Eacheng. And the sale price is $14.48, which is really good. It came. The blade does not have the "brand" on the side of the handle, the handle is also not of the same construction (the layers that make up the handle are vertical rather than horizontal as in the M8). However, the shape of the handle, the shape of the blade, the thickness, and the thickness/arrangement of the blade layers are, as far as I can tell, identical to the bare M8s (I'll prepare comparative buttshots next week - I'll use the flatbed scanner at work). There are the usual "protector sheets" on the two sheets of rubber (as in the photos, red = T88-I, black = T88-Taiji) and the whole assembled bat is itself shrink wrapped in cellophane (as were my bare M8s). Unlike the bare M8s the cellophane did NOT have the "Sanwei" writing on it, just plain, transparent, shrink-wrapped cellophane. Have not had a chance to weigh it, will do so next week. I played several games with it this evening, it seems about the same weight as the other assembled M8s in my bag, and it plays exactly like them too - lots of control for looping, hitting, pushing, serve return, etc. etc. I can't tell the difference between the red and black sides, out of habit most of the time I played with black on the forehand, but when I switched it around, I couldn't tell the difference. And to be honest - I couldn't really tell the difference between these rubbers and the Rakza X I had on the racket I normally would have used, other than that brand new rubber is great.. In other words - to all beginners out there - I have no reservations, based on my playing experience with this bat, on recommending it. The only reservation I might have comes to removing the rubber when you want to change it - I don't know how they glued the rubbers on, and I'm not ready to sacrifice the rubber just to find out. The M8 blade is also prone to peeling, which would mean it should be sealed, and I'm pretty sure this one isn't. Rubber removal might be simple in the end, or it might be a nightmare (as it is with Wal-Mart type premade bats, but is usually not with Chinese pre-mades). In any case it isn't something to worry about in the beginning, anyway. So with that caveat, I'd say it's an incredible value for money, as well as being a really good bat to play with. Buying one is a good deal, getting a half dozen for your club's juniors is a great investment. You even get a racket case with it!